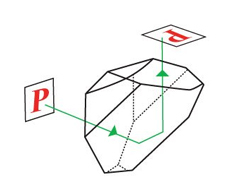 Roof Prisms, also called amici prisms or right angle roof prisms, do two things: invert the image and bend the line of sight through a 90° angle. They are excellent as prism diagonals in optical systems, because they erect the inverted image. Also ideal for use in spotting scopes, and any optical instrument where it is desirable to take an inverted image from an objective, turn it right side up, and bend it through a 90° angle, to maintain the correct visual orientation.